How very interesting! I love the quote that you shared. The idea of nurturing hatred is frightening. One hopes not to do that. I’ve read one book by this author, The Remains Of The Day. Loved it. I’ve wanted to read Never Let Me Go. I’ll add The Buried Giant to the list. And I think this fulfills the RIP qualifications perfectly. Thanks for writing about it, Margaret. I found Never Let Me Go very hard to read – not because of the writing, but because of the subject – very scary! As you know I own this one and am delighted that you loved it so much. Looking forward to reading it now. I’ve just read one book by Ishiguro and that’s Never Let Me Go, which like you I found quite frightening. I’d also like to read Remains of the Day at some stage: I’ve seen the film but not read the book. He’s a fantastic writer. Cath, I think you’ll like it. I’ve seen the film of The Remains of the Day years ago, can’t remember whether I read the book first or watched the film first. Either way I loved both. I will look for this book, it sounds like one I will like. 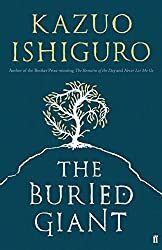 I’ve been wanting to read this–I really enjoy Ishiguro’s books too, and the premise is just so darned interesting. >It has elements of fantasy, myth and legend, of allegory and adventure and the perils of a quest. It is mysterious, beguiling and slippery, hard to pin down in parts and startlingly clear in others. Can it get any better? What a tantalizing description! Great review–maybe by year’s end I can get this one read.